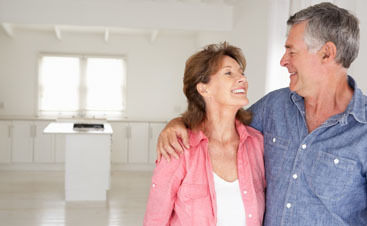 The Corner Cabinet has known Magda since her husband Dave joined our team as a Designer. We have heard about her delicious pierogis for quite some time, so when we found out that it was #PierogiDay, we jumped at the chance to learn her recipe and taste the amazing results! 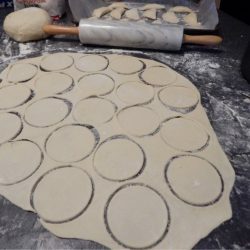 Keep reading below, as Magda shares her pierogi-making experience and recipe with us! Food. Kitchen. Love. Family. Pierogi. I spent my childhood watching my grandmother cook. She, at one end of a giant (I was small) kitchen table with no cookbook, no recipes, just her skills and lots of love. Me, across from her, watching and dreaming of being able to achieve the same kind of magic she created. I could taste her love in everything she made, I admired the magic of her cooking. Years went by and it turned out that I was, and still am, very good at … eating. I adore food. I just don’t like to cook. But there are some foods that can be bought at a grocery store, but just don’t measure up to the memories from childhood; the flavors, the scents, the textures are just never quite the same. One of the foods I like more than anything else are pierogi. Yup, those Polish “raviolis” are my comfort food. I could eat them every day. For those of you who are not Polish: pierogi is already plural, so you can’t call them “pierogis”. It makes us, Polish people, a bit crazy. A single one is called pieróg, and just like potato chips, you can never have just one, so you may never hear this word. 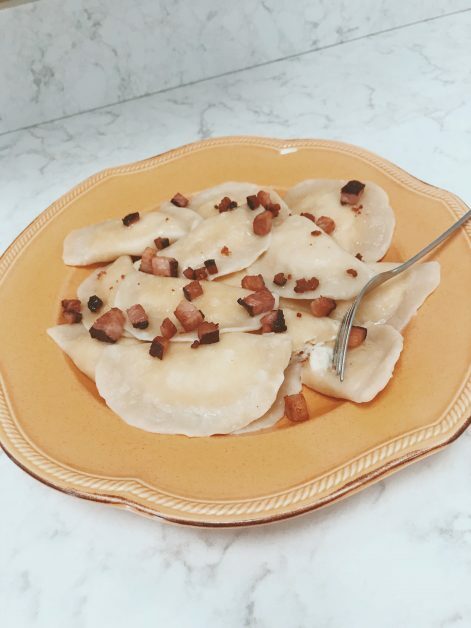 Pierogi are amazing, but homemade ones are pure heaven. So out of love for food, a tradition was born in my parents’ kitchen. Once a year, sometime in December, my mom and I get together and spend several hours creating magic in her kitchen. She makes the stuffing, and I make the dough. Together we fill little flat circle-shaped pieces of dough with love. We talk, sometimes we giggle like little girls, and we bond over the stories we recall from the past. Every year I look forward to those hours in the kitchen with my mom. Food. Kitchen. Love. Family. 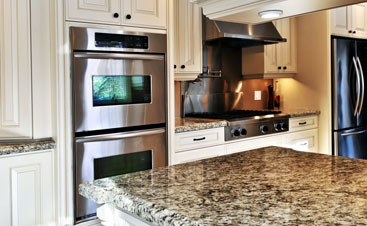 a large kitchen counter, the bigger the better — any kind will do: marble, granite, quartz; heck, laminate will be fine, too. Make a mountain of flour on the countertop with a small well in it. When the water is ready, take a large-blade knife and start pouring water into the well and folding in the flour from outside of the mountain into the well. 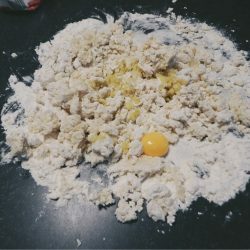 Take your time and incorporate most of the flour. Then add salt, oil and egg yolks. Now, the fun begins. 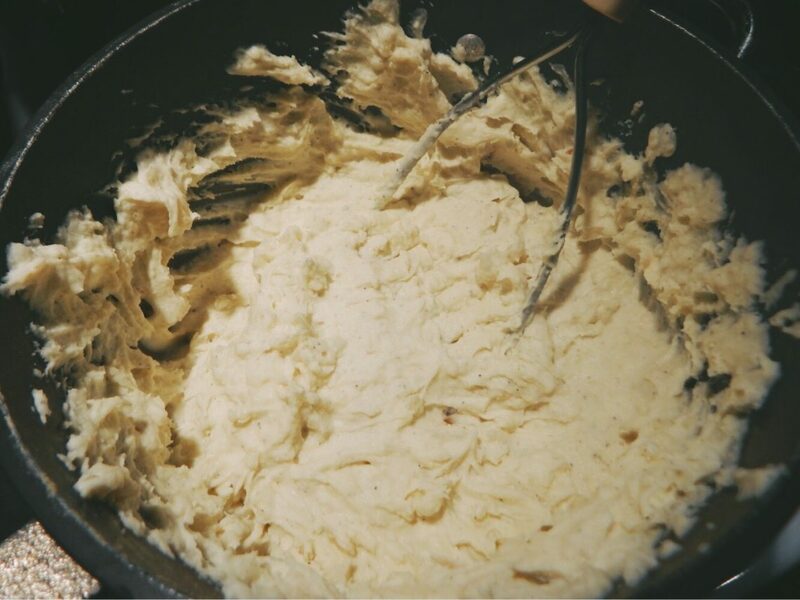 Start by combining any of the dry flour with all of the wet flour and wet ingredients. It will feel like a mess at the beginning. 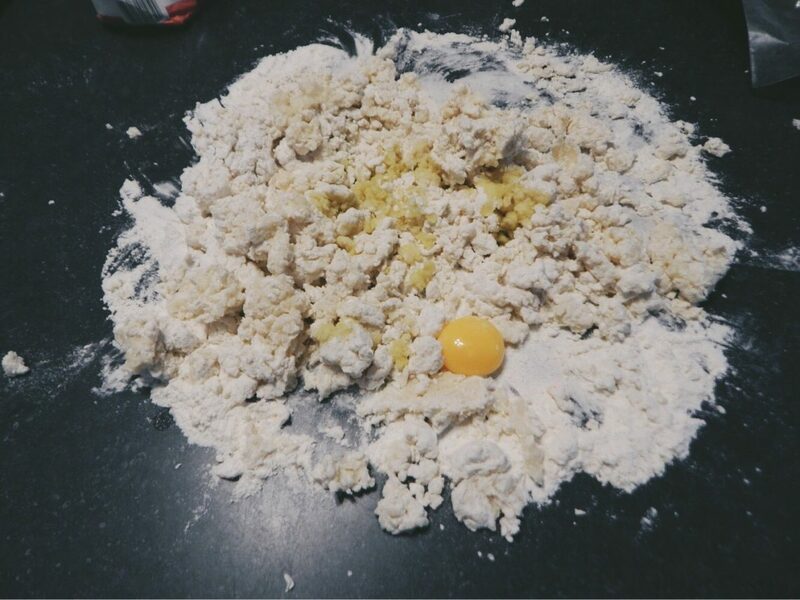 If it sticks to everything, add a bit more flour and continue. Eventually it will all be one soft, warm and a tiny bit sticky ball of dough. Start kneading. It should become soft, smooth and elastic very quickly. Do not over knead it, it will become tough and hard to roll out. 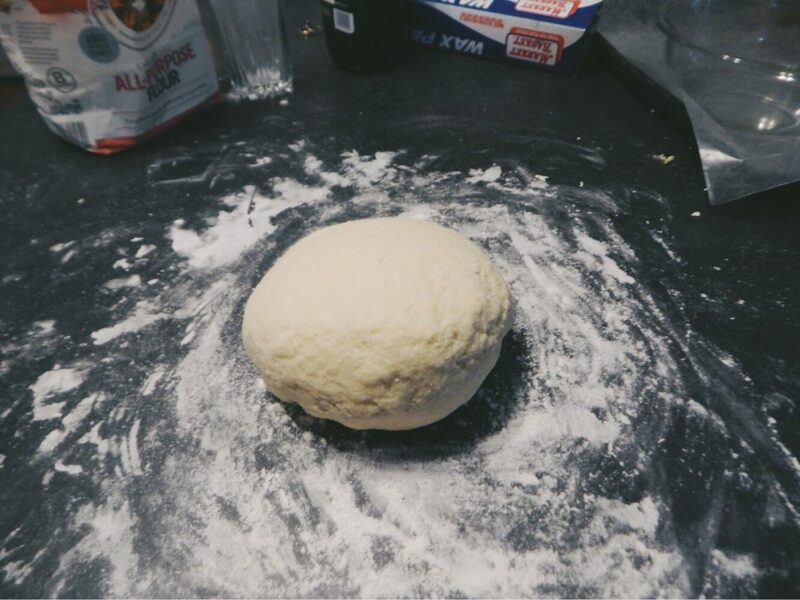 Flour your countertop, place the ball of dough on it and cover it with a bowl. Let it rest for 10-15 minutes. The dough is now ready. 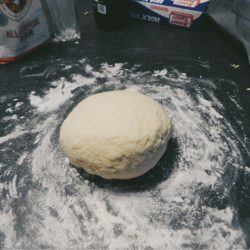 Cut off a baseball size chunk of dough, cover the rest. Do not try to roll out all of it at once. You want to make it in small batches to prevent the dough from drying out. Flour the countertop and roll out the dough to about 1/8 of an inch. You will have to keep flipping it over so it is not stuck to the countertop. Use flour to prevent sticking but do not overuse it. You want your dough to be somewhat sticky so it will stick to itself when you fill and seal pierogi. 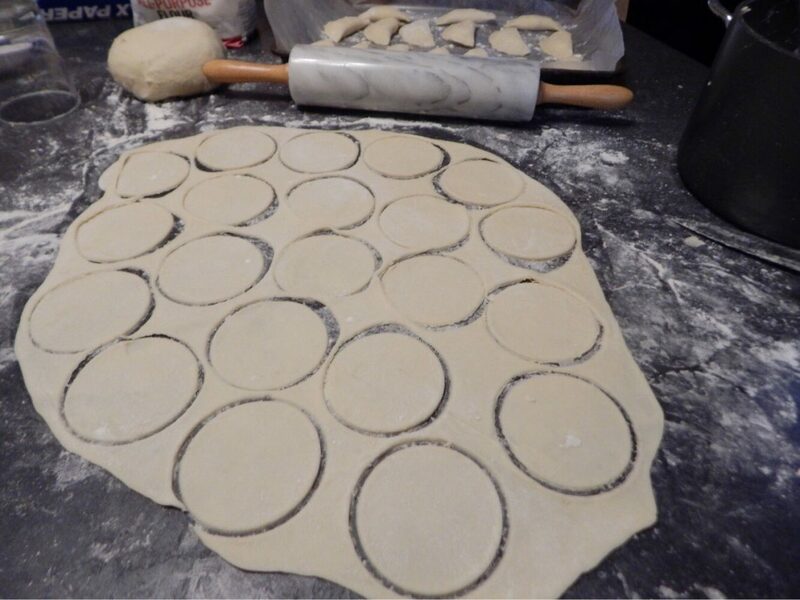 When you are happy with the thickness of your dough, start cutting out circles. Pick one up, flip it over and place a teaspoonful of stuffing in the middle. Fold the circle around the stuffing and start pinching the edge. If it doesn’t stick by itself use a little water to moisten the edge and keep pinching. If it is not sealed properly it will lose its stuffing while being cooked. 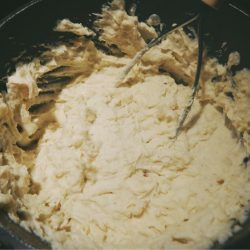 If you use the amounts in this recipe you will have about 125 pierogi. (They can be frozen.) In a large stock pot boil water and place small batches of pierogi in. Turn it down to a simmer. It takes about 3-4 minutes after they start floating up to the surface to have them fully cooked. 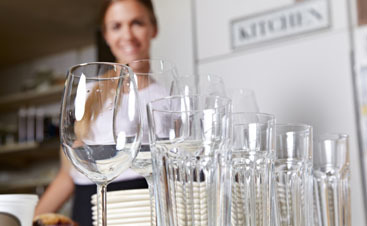 Gently remove them with a strainer. Serve with bacon bits. The truth about pierogi: you can make them with just about anything. They can be sweet or savory. There are as many recipes out there as there are Polish cooks. And this one happens to be my family’s favorite recipe. It takes me back to my grandmother’s kitchen, to the times of pure joy and happiness derived from sharing food and love with family. Enjoy!